The American cockroach is the largest of the house infesting cockroaches. It is also known as a "waterbug" or a sewer cockroach. They are most often found in commercial buildings but can infest houses. Contact for help with your cockroach problem. The Brownbanded cockroach can be found throughout structures but prefer warmer areas. These cockroaches are frequently found in other rooms other than the kitchen and bathroom. Control of this pest can be quite tricky. Contact for assistance in controlling your cockroach problem. The German cockroach is the most common of the structure infesting cockroaches in the United States. It is found throughout structures but prefers warm and humid locations such as kitchens and bathrooms. This cockroach is very persistent and often difficult to gain control. Don't do it alone, Contact for assitance in controlling this difficult problem. 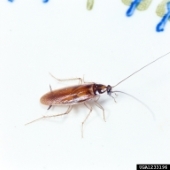 Commonly referred to as a "waterbug" because of their association with wet or damp locations, this cockroach is usually found in crawl spaces, basements and near floor drains. They are often confused with a black beetle due to the dark mahogany color and glossy sheen. Contact for assistance in controlling your cockroach problems. POW Pest specializes in commercial accounts where cockroaches are often the number one pest. We take pride in our honest approach to offering the best possible solution to your pest management needs. Choose the company with the expertise and experience to provide relief from these unwanted pests! We guarantee your satisfaction on all our services. Give us the opportunity and we will prove we are "The Smart Choice."